Chef Troy Graves has a lot on his plate at the moment. The 8-month-old Tallulah (4539 N Lincoln Ave, Chicago; (773) 942-7585) is doing fantastically, receiving amazing praise left and right, and the soon-to-be Eve (840 N. Wabash, Chicago) is receiving some finishing touches, slated to open October 27 for lunch and November 5 for dinner. 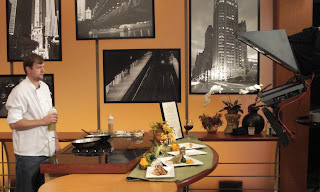 But despite all this upcoming excitement, Chef Graves took a moment from finalizing Eve's menu, to make an appearance on Chicago's WGN's Lunchbreak, and shared with viewers a recipe for a mouth-watering dish perfect for fall. Tallulah's Grilled Prawns and Baby Pumpkin stuffed with Chanterelles, Brussels Sprouts, Cipollini Onions is rustic and hearty, with layered textures and flavors - under Chef Grave's direction, it becomes simple enough to prepare at home! 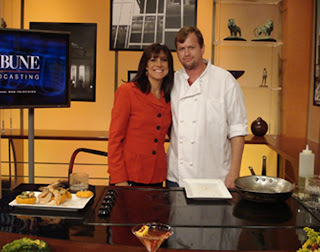 Chef Graves demonstrated the dish with WGN's Dina Bair and had the entire studio salivating at the delicious aroma. Dina's co-achor Tom Negovan remarked from the news desk that the smells were driving him crazy and he couldn't wait to try the dish. Luckily, Chef Graves prepared enough Spicy Maine Lobster Deviled Eggs (an appetizer featured on Tallulah's menu) for the entire crew at WGN. It was the perfect anecdote to appease a hungry stomach and just enough to leave them wanting more. To try Chef Graves' Grilled Prawns with Stuffed Baby Pumpkin, Chanterelles, Brussel Sprouts, and Cipollini Onions, visit Tallulah (4539 N Lincoln Ave, Chicago; (773) 942-7585) and taste for yourself what everyone is raving about. Or, for those adventurous gourmands out there, you can attempt it yourself; view Chef Troy Graves' complete WGN segment by clicking here.